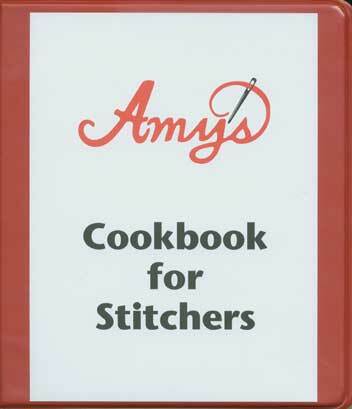 Description: Binder for Amy's Cookbook for Stitchers. Available in Red, blue, or green. 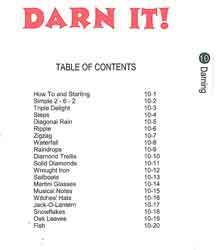 Description: This collection of stitches, tips, and information is the result of Amy's years of experience designing and teaching needlepoint. Presented in a cookbook format with sturdy 5.5" x 8" pages in a 3-ring binder (sold separately). Each chapter focuses on a different grouping of stitches. 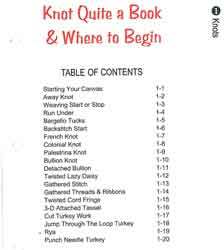 Chapter one, "Knot Quite a Book & Where to Begin" includes Knot stitches and techniques to get started. Description: This collection of stitches, tips, and information is the result of Amy's years of experience designing and teaching needlepoint. Presented in a cookbook format with sturdy 5.5" x 8" pages in a 3-ring binder (sold separately). Each chapter focuses on a different grouping of stitches. 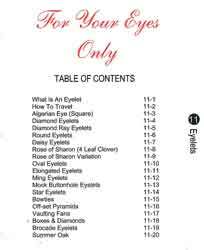 Chapter eleven, "For Your Eyes Only", includes Eyelet stitches. 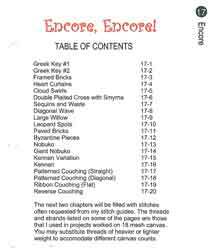 Description: This collection of stitches, tips, and information is the result of Amy's years of experience designing and teaching needlepoint. Presented in a cookbook format with sturdy 5.5" x 8" pages in a 3-ring binder (sold separately). Each chapter focuses on a different grouping of stitches. Chapter twelve, "Exotic Places". includes exotic sounding stitches. 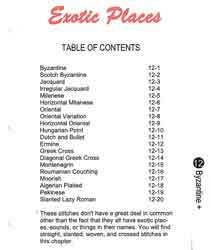 Description: This collection of stitches, tips, and information is the result of Amy's years of experience designing and teaching needlepoint. Presented in a cookbook format with sturdy 5.5" x 8" pages in a 3-ring binder (sold separately). Each chapter focuses on a different grouping of stitches. 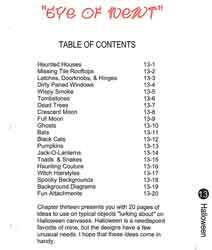 Chapter thirteen, "Eye of Newt" includes Halloween stitches. 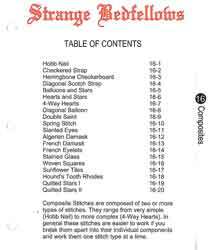 Description: This collection of stitches, tips, and information is the result of Amy's years of experience designing and teaching needlepoint. Presented in a cookbook format with sturdy 5.5" x 8" pages in a 3-ring binder (sold separately). Each chapter focuses on a different grouping of stitches. Chapter fourteen, "Naughty or Nice" includes Christmas stitches. 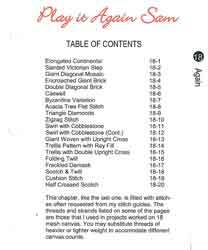 Description: This collection of stitches, tips, and information is the result of Amy's years of experience designing and teaching needlepoint. Presented in a cookbook format with sturdy 5.5" x 8" pages in a 3-ring binder (sold separately). Each chapter focuses on a different grouping of stitches. 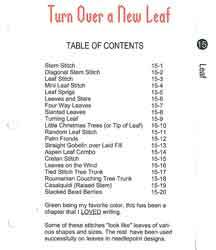 Chapter fifteen, "Turn Over a New Leaf" includes Leaf stitches. Description: This collection of stitches, tips, and information is the result of Amy's years of experience designing and teaching needlepoint. Presented in a cookbook format with sturdy 5.5" x 8" pages in a 3-ring binder (sold separately). Each chapter focuses on a different grouping of stitches. Chapter Sisxteen, "Strange Bedfellows", focuses on Composite stitches. Composite stitches are made up of more than one type of stitch. 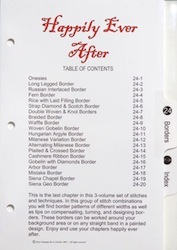 Also includes index for Chapters 9-16.includes Cross stitches. Description: This collection of stitches, tips, and information is the result of Amy's years of experience designing and teaching needlepoint. Presented in a cookbook format with sturdy 5.5" x 8" pages in a 3-ring binder (sold separately). Each chapter focuses on a different grouping of stitches. Chapter seventeen, "Encore, Encore! 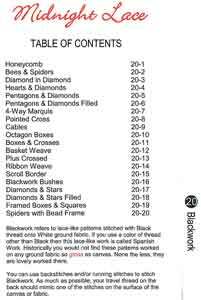 ", a variety of often requested stitches. 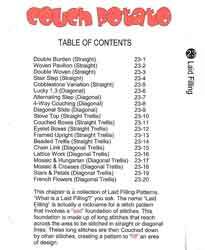 Description: This collection of stitches, tips, and information is the result of Amy's years of experience designing and teaching needlepoint. Presented in a cookbook format with sturdy 5.5" x 8" pages in a 3-ring binder (sold separately). Each chapter focuses on a different grouping of stitches. Chapter eighteen, "Play it Again Sam" includes stitches often requested from Amy's stitch guides. Description: This collection of stitches, tips, and information is the result of Amy's years of experience designing and teaching needlepoint. Presented in a cookbook format with sturdy 5.5" x 8" pages in a 3-ring binder (sold separately). Each chapter focuses on a different grouping of stitches. Chapter ninteen, "Jailhouse Rock" includes Bargello and related stitches. Description: This collection of stitches, tips, and information is the result of Amy's years of experience designing and teaching needlepoint. Presented in a cookbook format with sturdy 5.5" x 8" pages in a 3-ring binder (sold separately). Each chapter focuses on a different grouping of stitches. 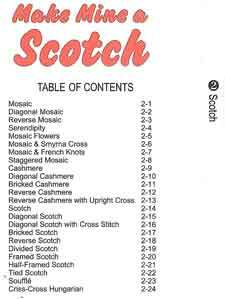 Chapter two, "Make Mine a Scotch", includes Scotch stitches. Description: This collection of stitches, tips, and information is the result of Amy's years of experience designing and teaching needlepoint. Presented in a cookbook format with sturdy 5.5" x 8" pages in a 3-ring binder (sold separately). Each chapter focuses on a different grouping of stitches. Chapter twenty, "Midnight Lace." Description: This collection of stitches, tips, and information is the result of Amy's years of experience designing and teaching needlepoint. Presented in a cookbook format with sturdy 5.5" x 8" pages in a 3-ring binder (sold separately). 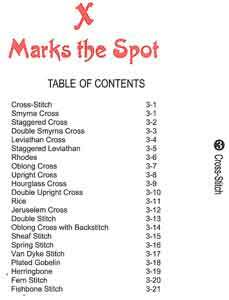 Each chapter focuses on a different grouping of stitches. Chapter twenty one, "How Does Your Garden Grow?" Description: This collection of stitches, tips, and information is the result of Amy's years of experience designing and teaching needlepoint. Presented in a cookbook format with sturdy 5.5" x 8" pages in a 3-ring binder (sold separately). Each chapter focuses on a different grouping of stitches. Chapter twenty two, "Dog's Breakfast." Description: This collection of stitches, tips, and information is the result of Amy's years of experience designing and teaching needlepoint. Presented in a cookbook format with sturdy 5.5" x 8" pages in a 3-ring binder (sold separately). Each chapter focuses on a different grouping of stitches. Chapter twenty three, "Couch Potato." Description: This collection of stitches, tips, and information is the result of Amy's years of experience designing and teaching needlepoint. Presented in a cookbook format with sturdy 5.5" x 8" pages in a 3-ring binder (sold separately). Each chapter focuses on a different grouping of stitches. Chapter twenty four, "Happily Ever After." Description: This collection of stitches, tips, and information is the result of Amy's years of experience designing and teaching needlepoint. Presented in a cookbook format with sturdy 5.5" x 8" pages in a 3-ring binder (sold separately). Each chapter focuses on a different grouping of stitches. 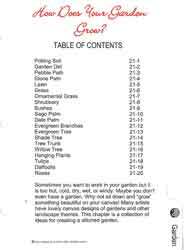 Chapter three, "X Marks the Spot", includes Cross stitches. Description: This collection of stitches, tips, and information is the result of Amy's years of experience designing and teaching needlepoint. Presented in a cookbook format with sturdy 5.5" x 8" pages in a 3-ring binder (sold separately). Each chapter focuses on a different grouping of stitches. 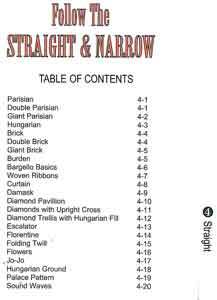 Chapter four, "Follow the Straight and Narrow", includes Straight stitches.